Cuba’s economic transformation in the 1990s cannot be considered the solution to the formidable challenge of substantially modifying the current productive structure of the economy in order to achieve development. Despite the changes, the reconstruction of the Cuban economy is an incipient process with a high level of indeterminacy. To put it simply, it is a challenge awaiting resolution. —Pedro Monreal (2002b, p. 29). esos resortes, los cuales no están realmente agotados, …si exhaustos y requieren de nuevas condiciones de funcionamiento .. —Juan Triana Cordoví (2002, p.12). Cuban economic debates seem to have their own cycles. For stretches of time they may disappear, only to reappear later covering the same old ground. Cuba’s economy, which had rebounded in the 1990s after a dramatic fall in 1990-1993, is once again in difficulty, due to lack of proper and sufficient reforms. In 2002, Pedro Monreal (2002a) edited a book where a group of Cuban academics and researchers (Julio Carranza, Pedro Monreal, Lázaro Peña, among others) presented significant critical analysis of the external sector policies and development strategy of the Cuban authorities during the 1990s. They pointed out several limitations of the then-current policies and proposed future prescriptions to improve the existing situation. The purpose of this paper is to offer alternative observations on the nature, extent and trends of transformations of the external sector of the Cuban economy in 1989-2002. The paper also reviews policy adjustments made by the authorities and their major achievements, failures and challenges for the future. The paper is organized as follows. The first section offers a general overview of the problems in the external sector at the beginning of the 1990s and the pressing need for new policies and reforms. The second section examines the key developments and trends in the external sector in 1989-2002. The third section discusses the nature and scope of the policies and reforms implemented by the government throughout this period, their major achievements and failures, and their impact on the performance of the external sector and of the economy at large. The fourth section considers some important lessons learned from external sector reforms in the transition countries and Latin America during the 1990s, especially from the successful Chilean experience. The fifth section presents some observations regarding the required transformation of external sector policies to boost the rate of growth of the economy. The last section contains some concluding remarks. Since the First Congress of the Cuban Communist Party in December 1975, the industrialization of the country and the centralized and socialist organization of the economy were defined as the foundations of the development strategy of the country. During this period, Cuba relied on subsidized exports to the former European socialist countries and considerable external aid from the Soviet Union.2 Additionally, Cuba relied on outdated and energy-wasting forms of technology from the socialist countries. After the political changes in Europe in the early 1990s, the impossibility of continuing to rely on subsidized exports, external aid and energy-wasting technology made unfeasible the expansion of this inward development strategy and even its operation. By the beginning of the 1990s Cuba had already experienced real GDP stagnation since 1985, a moratorium of its convertible currency external debt since 1986, an abrupt end to the substantial aid in the form of trade subsidies3 and automatic soft trade deficit financing,4 and the tightening of the U.S. embargo. Almost 80% of its trade was with CMEA countries. Therefore, Cuba faced the urgent task to adjust its international economic relations and to reallocate its trade in a context of limited access to foreign aid and international financing. The stagnation in real GDP since 1985 reflected the limits of the extensive growth model that had been in effect, the end of the economic liberalization measures adopted in the early 1980s that eliminated the use of most market mechanisms and practices, and the increasing vulnerability of the external sector. The extensive growth model resulted in low efficiency, required a high level of external aid and subsidies and implied a high-income elasticity of imports. The measures introduced in 1986, in the framework of the infelicitously-termed “Campaign for the Rectification of Errors and Negative Tendencies,” eliminated most liberalization measures, put the economy under tighter central control, and made worst the difficult external situation. As a result, the economy suffered from profound distortions, and inefficiencies were paramount. The great challenge for the Cuban authorities in the early 1990s was to understand the profound implications of the key changes and to articulate the necessary adjustments to overcome them strategically in order to recover the viability of the Cuba economy in a new international context. In 1989-2002, exports of goods and services fell by 29% and imports of goods and services by 44%, resulting in a decline in the economy’s openness index (as measured by the ratio of the value of exports of goods and services to GDP) from 0.30 in 1989 to 0.14 in 2002, and of the import coefficient (ratio of the value of imports to GDP) from 0.43 in 1989 to 0.16 in 2002 (see Table 1). There was also a marked decline in the gross investment rate; it fell from 0.162 in 1997 to 0.120 in 2002 (see Table 1) and it is likely that it diminished from approximately 0.30 in the early 1990s to 0.162 in 1997. Vis-à-vis the rest of the world, Cuba derives its potential competitive advantage from its natural resources: land well suited for sun-and-sand tourism; the cultivation of particular crops like tobacco; minerals deposits like nickel and cobalt; and low wage rates of a skilled labor force. However, Cuba suffers a relative shortage of capital. The concept of intra-industry trade extends the principle of competitive advantage to include finer differences in endowments of specific elements of human capital and technological capability. However, potential competitive advantage does not always convert into effective or realized competitive advantage, in the case of Cuba due to the problems of lack of adequate information in a socialist economy without market prices, inflexible bureaucracy and out-of-date business administration practices, accentuated by the lack of proper accounting and financial practices. Gross mismanagement of traditional export sectors, such as agriculture, poor marketing across all sectors, and price distortions, meant that some sectors and sub-sectors with obvious strengths and advantages in relative factor endowments, contributed little or nothing to exports. It would be dangerous and incorrect to assume anything close to a maximal response to policy changes. Basic products, the typical export basket of underdeveloped countries (sugar, nickel, tobacco, fish products and citrus), dominate Cuban exports, making export revenues highly sensitive to changes in commodity prices. Due partially to an overvalued Cuban peso pegged to the U.S. dollar, the dollar value of exports of goods increased only 26% in 1993-2002, one of the worst performances in Latin America. With the exception of tobacco, minerals and other minor products, the rest of the Cuban export sectors performed poorly. This poor export performance has been aggravated by unfavorable changes in terms of trade since 1997. Imports of goods increased from $1,984 million in 1993 to $4,161 in 2002 (see Table 2); part of this increase is attributed to the tourism sector, however, and total imports of goods in 2002 were still only 51% of their 1989 level. In addition to an export sector lacking dynamism during 1993-2002, another characteristic of Cuban exports was their relative reliance on low level processing of natural resources and the stagnation of the efforts to expand export activities with greater value added and technological complexity. There were some notable changes in the composition of exports, mainly reflecting developments in sugar, nickel and cobalt, tobacco, fish and seafood, and other goods. Sugar represented 66% of total exports of goods in 1993 but only 33% in 2002; meanwhile, nickel and cobalt exports increased from 12% to 34%, and tobacco from 6% to 16%. Nickel and cobalt exports increased at annual average rate of growth of 14.7% and tobacco at 13.7% during 1993-2002. The sugar agroindustry has been lagging due to both technological obsolescence and low agricultural and industrial yields. Sugar production decreased 50% in 1989-2002 (see Table 1) and faces a major crisis. Making this sector competitive again would require high levels of investment as well as fundamental changes to correct price distortions. Sugar has been used as collateral to cover short and medium term loans made to Cuba by international capital markets, and its availability or scarcity strongly influences the country risk evaluations of the Cuban economy. The sugar industry, downsized in 2002, expected a gloomy 2.0 million ton output for the 2003 harvest season, the lowest production on record in 90 years, or since 1920. As Peña (2002, p. 108) indicates, total cost per ton of Cuban sugar in the period 1990-1995 was above the average cost on the world market (US$434.0 vis-à-vis US$360.8). Furthermore, his data shows that during the 1980s, Cuban production costs were higher than those of its global competitors (Australia, Brazil and Thailand). The persistent organizational and inefficiency problems of the sugar sector have contributed to the rise in financing costs. The reforms of the 1990s were limited and were not accompanied with the exigencies imposed by the highly competitive conditions of the sugar international market. The development of services exports partly reflects normalization of this sector after it was neglected until the 1990s. Services exports increased continuously up to 2000, boosted by higher earnings from tourism and transport. Tourism became the most dynamic sector of the economy or the growth engine during the “Special Period,” with over 23.1% average annual growth in 1990-2000. 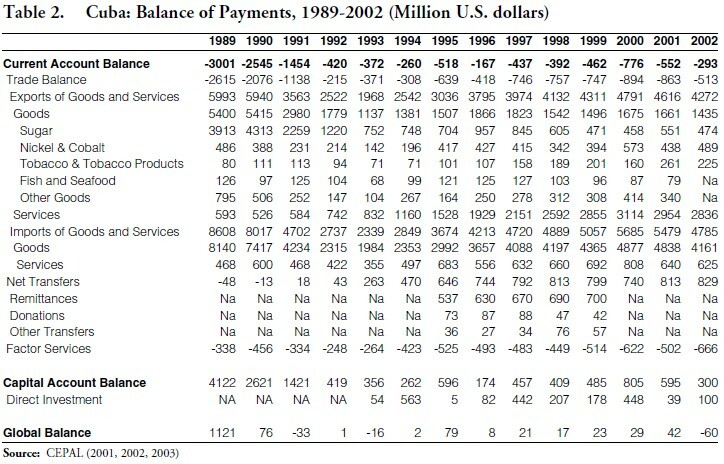 Services exports dropped by 9% in 2000-2002 (see Table 2). The accelerated growth of tourism in 1990-2000 was based on the so-called sand and sun tourism predicated on an intensive use of natural resources, where Cuba’s competitive margins are relatively greater and more sustainable, despite competition from the Caribbean. It also depended significantly on the European and Canadian tourists, who have a preference for escaping from the harsh winter months. Gross income from tourism replaced sugar as the main source of foreign exchange in 1994. This was due both to the rapid expansion of tourism and to the contraction in sugar production and exports. However, the direct import component of tourism is around 75% vis-à-vis 25% in sugar. Imports have been repressed by the slow export expansion and the chronic external debt crisis. The shrinking share of machinery and equipment in total imports—reflected in the collapse of the investment rate, which is very low and decreased in 1990- 2002—results in part because a large part of the import bill (at least 20% of the total) has gone to finance oil imports. The deficit of trade in goods and services, or the trade balance, increased steadily from US$371 million in 1993 to US$894 million in 2000, but then it decreased to US$863 million in 2001 and to US$513 million in 2002, as tourism and foreign direct investment (FDI) declined. Net transfers, mainly personal remittances from Cubans living abroad, and especially in the United States, to family and friends in the island have been positive and remain a major source of financing since 1993, when they substantially increased due to the legalization of foreign exchange holdings (see Table 2). Net transfers have surpassed other sources of income, like sugar, FDI or net income from tourism, since 1998. Net transfers increased US$263 million in 1993 to US$829 million in 2002, or at average annual rate of 13.6%; however, they have remained almost flat since 1998. Deficits in factor services have increased, as a consequence of rising indebtedness and profit repatriation of FDI, from US$264 million in 1993 to US$666 million in 2002 (see Table 2), or at average annual rate of 10.8%. The growth of the aggregate current account deficit in the 1990s reflected the interaction of economic recovery, structural factors, external shocks, erroneous development strategy and insufficient economic reform measures. Structural domestic factors seem to explain the disappointing export performance. Macroeconomic policies temporarily exacerbated imbalances up to 1993 due to the lack of a proper stabilization policy, with correction eventually being made through policy measures and/or adjustments triggered by the GDP and export contraction in 1990- 1993.6 Unfortunately, expansionary fiscal/monetary policies in the face of poor external performance have been used again since 2001. The current account deficits reflect a net transfer of resources from abroad that has helped to boost domestic economic activity. In other words, in the absence of the deficits, the economic recovery would have been slower than it has been. The long-term concern is that current account deficits, especially those largely financed by foreign debt, are unsustainable. However, reducing the deficits could lower short-term recovery prospects under current conditions. Deficits can be a normal part of the development process, but the key is to distinguish between good and bad deficits. Good deficits are those that arise from external borrowing used to invest in productive assets, which will eventually produce a return to service and pay off the debt. Bad deficits are those used to finance current economic activity (consumption) and will lead eventually to default. To reduce the risks of non-sustainable current account deficits, FDI is preferred to debt financing. Cuba’s terms of trade noticeably worsened after 1997, partly because the world market price of major international commodities—except for oil and some metals—fell while the average dollar prices of manufactured goods exports remained unchanged or increased slightly. Cuba’s purchasing power of exports index worsened from 153 in 1997 to 100 in 2002, a decline 35%. Concurrently, the terms of trade index steadily deteriorated from 123 in 1997 to 79 in 2002, or a 36% decline, which explains the behavior of the purchasing power of exports index. The lower the degree of openness of a country’s economy, dependence on a few commodity exports, and weakness of institutions, the larger its exposure and vulnerability to variations in the terms of trade. Since 1997, Cuba has been subject to sharp terms of trade fluctuations leading to a reduction of exports and, hence, of output recovery. The adjustment to the terms of trade shock requires either an economic slowdown (or recession) or a modification in relative prices, implying an increase in the price of tradables relative to the price of nontradables; that is, a depreciation of the real exchange rate and some expenditure switching. Capital inflows fell more than tenfold from US$4,122 million in 1989 to US$356 million in 1993 as the soft financing from the CMEA disappeared while Western capital markets remained relatively closed. Subsequently, capital inflows averaged US$454 million per annum in the period 1994-2002 (see Table 2). Therefore, Cuba was only able to finance an average current account deficit of US$429 million in 1994-2002 vis-à-vis US$3,001 million in 1989 and US$2,545 million in 1990. The current account deficit was further reduced to only US$293 million in 2002. The potential for FDI to stimulate economic growth is well recognized. Among other ways, it can supplement domestic savings, improve the allocation of resources, and act as a conduit for new technologies and know-how. For Cuba, burdened by decades of socialist technological backwardness, FDI can facilitate the process of modernization, economic reform, and enterprise restructuring and help improve international competitiveness. According to CEPAL (2001, p. 1), in 2000, joint ventures with foreign investors generated around 6% of output, produced 16% of total exports of goods and services, and provided direct employment for 33,000 workers. For Cuba, opening the economy to Western capital inflows has meant excessive indebtedness in good times—when economic growth improved international perceptions of creditworthiness and interest rate spreads were low—and a sharp reversal of inflows in bad times—when adverse shocks caused severe deterioration of international perception of creditworthiness and interest rate spreads were high. However, insufficient (ex ante) accumulation of foreign reserves, lack of access to additional sources of liquidity, and the sudden stop of capital inflows resulted in default of external obligations in 1986 and chronic balance of payments problems with Western countries. For countries in default, the normalization of relations with official (the Paris Club) and commercial (the London Club) creditors is generally a precondition for reentering international credit markets. Certain types of investors are legally prohibited from lending to countries in default, if they are not already deterred by a country’s balance of payments prospects. However, some short-term lenders extend cash at high yields even in the absence of fundamental reforms. Due to the lack of structural reforms, the difficult situation in the early 1990s and the numerous obstacles to be overcome, Cuba has failed to create the conditions for attracting sustained and increasing foreign capital inflows and even suffered setbacks. Cuba has been only able to attract funds temporarily. On April 1, 2003, Moody’s classified Cuba’s credit ratings as Caa1 or Caa2—“speculative” and “demonstrate very weak creditworthiness relative to other issuers”— because of chronic delinquencies and mounting short-term debts.8 Also, the Economist Intelligence Unit classified Cuba’s sovereign debt risk as D and currency risk as C.
Cuba’s oil bill debt with Venezuela’s Petróleos de Venezuela S.A. (PDVSA) rose to US$266 million by May 2003. CUPET, Cuba’s state-owned and operated oil company has fallen behind on payments to PDVSA repeatedly since Cuba and Venezuela signed a trade agreement in October 2000. PDVSA supplies approximately 35% of the island’s oil under generous financing terms that amount to a 25% price subsidy over five years. Due to the value of oil exports, Venezuela is now Cuba’s leading trade partner. In 2002, Cuba fell into arrears on US$100 million in short-term credit lines from Panamanian banks and trading companies based in the Colon Free Zone. Cuba has traditionally circumvented the U.S. trade embargo by sourcing American consumer goods and technology through Panama-based suppliers. Panamanian lenders have also helped to finance Cuba’s sugar crop in recent years. In May 2003, Spain acknowledged—in response to a parliamentary inquiry—that Cuba is Spain’s top foreign debtor government, presently in default on an estimated US$816 million. France’s export financing agency, COFACE, has suspended Cuba’s US$175million credit line after Cuba fell more than a year behind in repayment of annual loans for the purchase of French agricultural products and capital goods in 2001. The Italian government withdrew a proposed US$40 million aid package in early June 2003 in response to Cuba’s crackdown on internal dissents. The Cuban government had already accumulated a short-term debt of US$73 million with Italy. Italy, which assumed the presidency of the European Union (EU) in July 2003, has called for an EU embargo on all non-humanitarian assistance to Cuba. Cuba’s worsening foreign exchange constraint and foreign debt problems have brought about a reprioritization of key commercial relationships. Mexico, Canada and Spain have all lost Cuban trade share to a diverse assortment of emerging economic partners in Latin America (Brazil and Venezuela), Asia (China, Malaysia and Vietnam), Europe (Belgium and Germany), and the Middle East (Iran and the Muslim world at large). In 1961, under the Kennedy Administration, the U.S. imposed a comprehensive embargo against Americans who wanted to trade with, travel to, or invest in Cuba. In 1992, the U.S. enacted the Cuban Democracy Act, the so-called Torriceli Law, that tightened the embargo and changed its focus from U.S. national security to promoting political reform within Cuba. It prohibited U.S. subsidiaries in third countries to trade with Cuba and stipulated that ships that load and unload merchandise in Cuban ports are banned from entering U.S. ports for a period of 6 months from the date of arrival in Cuba. This latter provision increases Cuba’s freight costs and delays delivery of traded goods. In 1996, the U.S. enacted the Cuban Liberty and Democratic Solidarity Act, the Helms- Burton Law. This law imposes extra-territorial penalties on foreign companies and citizens that traffic in property that Cuba expropriated from U.S. citizens, hindering foreign investment flows to Cuba. The U.S. embargo is inconsistent because the United States allows around US$800 million to flow annually from Cuban-Americans or Cubans living in South Florida to their families in the island. Additionally, Cuban-Americans and Americans are visiting Cuba in record numbers. More than 200 U.S. universities and research centers have been licensed by the Treasury Department to lead trips to Cuba. About 150,000 Americans visited with such permission in 2002. Another estimated 50,000 slipped into Cuba illegally from third countries. In 2000, U.S. lawmakers carved an important exemption in the trade embargo by legalizing the sale of food and medicines. Since then, U.S. companies have sold nearly $200 million in corn, rice, and other commodities to the island. Finally, by pointing to the U.S. “blockade,” Cubans, whose affection for the American way of life (individual freedoms and prosperity) is very strong, are taught by the authorities that the embargo is clear proof that the United States wants to promote misery in Cuba, that it is using economic deprivation to promote political change, and that the United States must be regarded as their enemy, responsible for the poor economic situation instead of the flawed socialist system and erroneous economic policies in place. Furthermore, they are an excuse for the regime’s economic ineptitude and repression. Since the breakup of the USSR, and with the maintenance of the embargo, it is the Cuban people who suffer the costs of the sanctions. 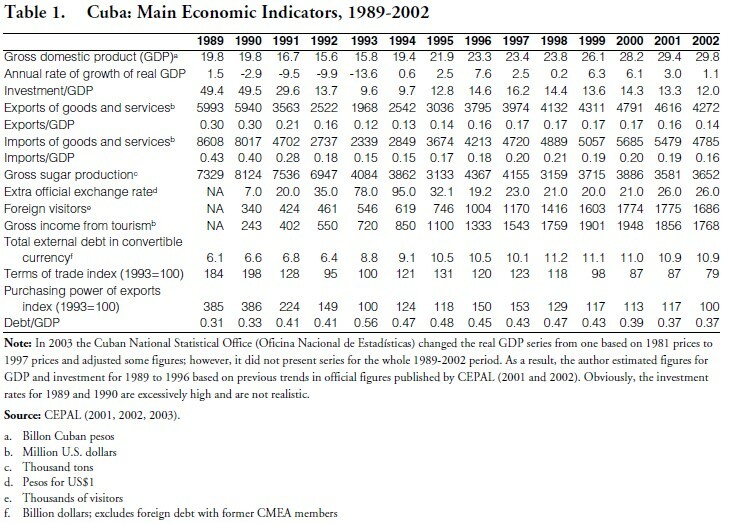 The Cuban authorities managed to halt the striking decline in GDP from 1990-1993, maintained positive growth of GDP for nine consecutive years (1994-2002), substantially modified the country’s international relations based on new products and markets, and attained greater macroeconomic stability. The “extra official” exchange rate appreciated almost steadily from 1994 to 1999. However, Cuba still faces chronic disequilibrium in the balance of payments and has not been able to generate self-sustained growth. The partial recoveries of the external sector and of the economy since 1994 have been significant but insufficient achievements. Utilization of existing capacity is still below 1989 levels in most agricultural and manufacturing activities (see Table 3); GDP is below 1985 or 1989 levels (a retrogression of more than 17 years); and GDP growth became less dynamic over the last four years. In summary, Cuba has been trapped in low and declining living standards since 1985 due to misguided development strategy and policies and persistent external bottlenecks. The internal economic reforms initiated since the breakup of the Communist trading bloc are based on the premise of maintaining government control of the economy. Some required changes have been introduced into the system on a limited and piecemeal fashion and are allowed only as long as their consequences remain under central control. Tourism, remittances, FDI, and short-term commercial credits have only partially substituted for the massive external subsidies and aid from the former Soviet Union. Exports—primarily of basic commodities—have declined since 1996. An elementary type of tourism has been developed, but the international political and economical setting is not favorable to its continued expansion due the events after September 11, 2001, to the recent confrontations with the Italian and Spanish governments— countries where 17% of tourists originate—and the economic slowdown in Europe. The government also does all it can to prevent that tourism activities would have spillover effects to the rest of the economy. During 1990-2002, the main policies of the government for the external sector were: (1) maintain the strategy of import substitution and a central command economy as the foundations of the development strategy, with very limited use of market mechanisms and practices; (2) maintain an overvalued official exchange rate and ration available foreign exchange; (3) encourage dollarization of the economy to boost up remittances; (4) promote tourism and FDI in joint ventures to expand exports and to have access to foreign markets, technology and capital; (5) decentralize firms, up-grade their business practices and allow some export firms to have privileged access to the foreign exchange they generate; (6) make selective payments and arrangements on the external debt; and (7) stretch the period of external adjustment to reduce social costs. Despite the major global changes since the breakup of the Soviet Union, Cuba’s leadership has continued to insist on a centrally-controlled economy and import substitution as viable ways into the future and to maintain that it is the American “blockade” rather than the inefficiency of the inward socialist and centrally controlled system that is the prime culprit behind Cuba’s economic problems. As we indicated above, this in not the case, and only a poor excuse. The development policy of the external sector in place in 1994-2002 would have to be modified significantly to promote high and self-sustained development in the future. Cuba needs a strategy for a successful international insertion. A small country like Cuba lacks alternatives outside an export-oriented strategy based on the intensive use of market mechanisms and practices, as China, Vietnam and former socialist European countries have done quite effectively. Only through exports expansion and application of market mechanisms, can Cuba obtain the resources necessary for investment and continuous economic expansion based on productivy increases related to specialization, economies of scale, and learning by doing. Cuba cannot have both a fixed exchange rate pegged to the U.S. dollar and an independent fiscal/monetary policy, as it had in 1990-1993 and more recently in 2001-2003. These inconsistent macroeconomic policies have been accentuated by Cuba’s lack of openness to trade, high dependence on basic commodities and services, and low external liquidity.13 For a pegged exchange rate to work on a sustainable basis it must be set at realistic levels, and there must not be actual or potential external debt problems and there has to be economic policy credibility. As a result of Cuban wrong and inconsistent macroeconomic policies, there has been an almost unrelenting increase in the spread of the interest rate that Cuba has to pay in international credit markets as a result of perceptions of the country’s deteriorated ability to service its debt and the real possibility of default (CEPAL, 2001, p 138, as well as Moody’s and the Economist Intelligence Unit’s worsening credit ratings as of April 2003 and September 2003, respectively). The lack of a market-established and unified exchange rate also obstructs the determination of Cuban costs and prices truly comparable to those in the world market, affects the Cuban economy as a whole and has influenced the marked decline of the sugar industry. Forward and backward linkages need to be stimulated through a unified exchange rate, to overcome the phenomenon of a few dynamic exporting sectors based on natural resources amid a stagnant overall economy, and to foster the spillovers to the rest of the economy. Cuba only has liberalized FDI partially. Major obstacles that still exist are the reluctance to allow ownership of land or capital, the bureaucratization of procedures for foreign investment authorization, the selection by the government of the employees of joint ventures, and a system of remuneration of workers whereby wage rates paid by foreign investors to the government employment agencies are ten times what the workers are paid. Also, FDI is unlikely to be attracted to Cuba in significant amounts because the protection of property rights is arbitrary and weak, and the institutional framework for market- based activity is deficient. FDI in Cuba has outgrown its institutional underpinnings. This is not surprising, as access to high quality investment funds, is often conditional on the implementation of structural reforms that favor market mechanisms and practices and sound macroeconomic policies. It is sound policy to change the norms, regulations and economic organization and management systems in state-owned enterprises in order to adapt the country to the new circumstances under which is currently developing (CEPAL, 2001, p. 4). Nevertheless, to be effective, enterprise reform should occur in the context of a deep transformation of the economy and not of increasing distortions, controls and backtracking from further reforms. It is very important to encourage remittances to increase the level of economic activity in Cuba. However, the restrictions on the use of the remittances for consumption purposes should be eliminated as soon as possible because they act as a disincentive to increasing remittances. The practice of selective payments on the external debt has increased the risk and uncertainty of foreign lending and investment in Cuba. Specifically, it has increased both the interest rates that Cuba has to pay for short-term loans and has reduced the quality of investment that can be attracted. The slow and piecemeal external sector reforms have not only slowed the change towards the market but also have slowed the rate of economic recovery and have had resulted in high welfare costs by discouraging production of tradables, increasing major distortions in the domestic markets, reducing employment and worsening the income distribution. What is truly amazing, in retrospect, is that the pattern of development that emerged from the policy decisions of the 1990-1993 crises has represented an essential continuity, rather than a significant transformation of the previous pattern. Unfortunately, Cuba’s economic policies have not been focused on development or on adjusting the economy to the new international environment and conditions, but rather on preserving Castro’s specific view of socialism and his absolute power. 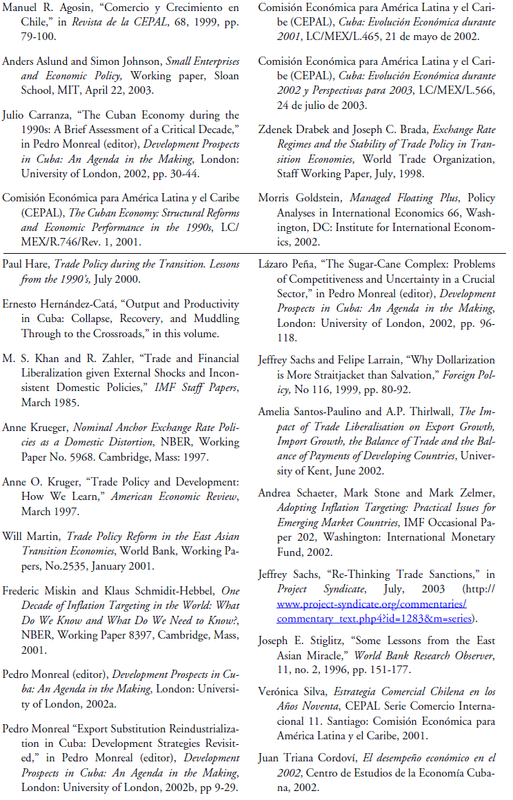 The experiences of Central European, former Soviet Union and Latin American countries in the 1990s shows the critical role of macroeconomic policies and exchange rate management in making foreign trade reform (or trade liberalization) sustainable and part of an effective pro-growth strategy. In several of these countries, notable progress toward more open foreign trade regimes and faster export growth failed to translate into real expansion of output, productivity and employment. In this context, it is not surprising that unemployment, poverty, and income inequality increased. One of the key purposes of trade reform is to promote economic growth by capturing the static and dynamic gains from trade through increased productivity—more efficient use of resources—and a shift in resources from inefficient to efficient activities and sectors; greater external competition among previously protected firms to change their behavior and performance; an increase in the flow of knowledge and investment, and ultimately a faster rate of capital formation and technical progress. Barriers to trade and anti-export bias reduce export growth below potential. Import controls are likely to reduce efficiency, although they protect the balance of payments at the same time in the short run. Countries with well-functioning markets and a better human resource base benefit more from productivity gains resulting from trade reform than countries with less well-functioning markets. This explains the need for broad and in-depth systematic reforms to liberalize prices and wages, implementation of sound accounting and financial practices, and reduction of the bureaucratic regulations in state owned enterprises so that they will be to react to the new policy environment. The presumption is that trade reform will raise the growth of exports and imports, but the implications for the trade balance and the balance of payments are ambiguous because this depends on the relative impact of trade liberalization on export and import growth, and on what happens to the prices of traded goods. Trade reform may promote growth from the supply side, but if the balance of payments worsens, growth may be negatively affected from the demand side because the payments deficits resulting from trade reform are unsustainable and need to be rectified by relative price (real exchange rate) adjustments. Studies of trade reform in developing countries have paid a lot of attention to its impact on export performance, economic growth, employment, wage inequality and income distribution, but very little to its impact on imports, the balance of trade and the balance of payments. These are equally important areas of analysis because if trade reform leads to faster growth of imports than exports, it can have serious implications for the balance of payments of countries that may constrain growth below their productive potential. That is to say, while trade reform may promote growth from the supply side through a more efficient allocation of resources, it may constrain growth from the demand side unless a balance between imports and exports can be maintained through exchange rate adjustment or deficits can be financed through sustainable capital inflows. • First, reductions in export and import duties significantly affected the growth of exports and imports, with the impact on import growth being greater. For a one percentage point reduction in duties, exports grew by just under 0.2%, while imports grew by between 0.2 and 0.4%. • Second, the impact of a more liberalized trade regime, in all its manifestations, independently of duty reductions, raised import growth by more than exports. Evidently, it was easier for importers to import than for producers to reallocate resources to the tradables sector and to develop export markets. Compared to the pre-liberalization regime, the process of liberalization raised export growth by just under 2%, while import growth has increased by between 2 and 9%. • Third, liberalization increased the income elasticities of demand for imports and exports by roughly equal amounts, but the price elasticity of demand for imports increased more than for exports. Fourth, the pure effect of trade liberalization, independent of duty changes, worsened the trade balance by over 2% of GDP, but the impact on the current account of the balance of payments was less, worsening by approximately 0.8% of GDP on average. The effects of liberalization on the trade balance and balance of payments were similar across the regions of Africa, East Asia, Latin America and South Asia, in the sense that all regions suffered deterioration. • Fifth, the impact of liberalization differed according to whether countries started highly protected or not. The positive effect of liberalization on import growth, and the adverse effects on the trade balance and balance of payments, were all greater in the more highly protected countries. Therefore, the policy conclusion is that countries that have promoted trade liberalization need to take great care in the nature and sequencing of the liberalization of exports and imports to achieve a better balance between export and import performance. Liberalization for liberalization’s sake that leads to a massive flood of imports, without a corresponding rise in exports, will be counterproductive because, except for countries able to run payments surpluses, all deficit countries ultimately become balance of payments- constrained in their growth performance. The transition from a restrictive to an open trade regime can also impose short-term adjustment costs through efforts to restore macroeconomic stabilization, such as reductions in fiscal deficits, that could hurt the country’s already weak infrastructure. Even a relative strong export performance might not result in faster economic expansion, because the benefits of trade liberalization can be more than offset by policies that work against sustainable outward orientation. To promote a sustainable macroeconomic environment, countries have to deal with transition and adjustment costs in a balanced and consistent manner. For that reason, it is also very important to adopt exchange rates and other complementary policies that help keep competitiveness and outward orientation. Export expansion needs to be fast enough to allow the economy to grow at the maximum potential rate allowed by its supply-side productive potential, while keeping the current account deficit to a level that can be financed on a sustainable basis. Capital account liberalization could result in large capital inflows with the undesired appreciation of the real exchange rate. To discourage short-term inflows and to prevent an excessive appreciation of the domestic currency, Chile and Colombia, successfully enforced tax and reserve requirements on foreign credits and deposits during the 1990s. Argentina is now establishing controls to prevent short-term capital inflows. The costs of real appreciation should not be underestimated, particularly in a context of rapid trade liberalization, because the key prices of labor relative to capital, of exports relative to imports, and of tradables relative to nontradables depend on the evolution of real exchange rates. Some policy mixes could led to a significant real appreciation of the domestic currency, spiraling current account deficits, a major increase in the external debt, and eventually to a foreign exchange and financial crisis. Krueger (1997) warns of the dangers of trade liberalization that is not accompanied by competitive exchange rate policies. In other words, a realistic exchange rate is key to protect domestic firms from imports and gives domestic firms greater incentives to export during a trade liberalization process. 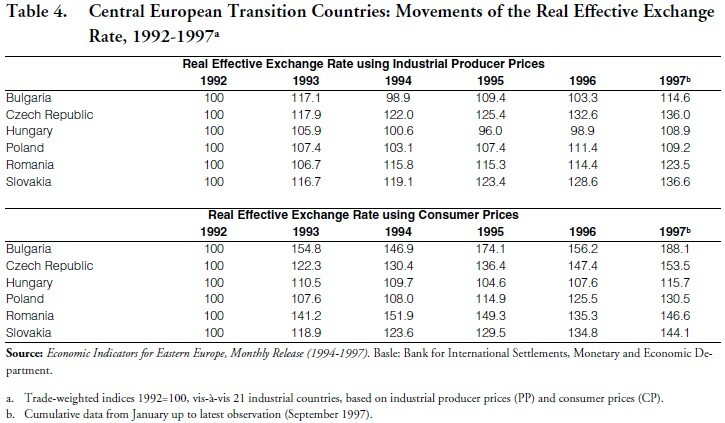 Drabek and Brada (1998) show that trade liberalization followed up by current account and capital account liberalization in six Central European nations (Bulgaria, the Czech Republic, Hungary, Poland, Romania, and Slovakia) led to major appreciations of the real exchange rates (see Table 4) and, hence, to a reversal of some trade liberalization measures. In other words, in these six transition countries, trade liberalization was not sufficient to keep competitive real exchange rates that allow continuous export and economic growth. The concurrent sharp appreciation in the real effective exchange rate added considerably to the growth of domestic demand for imported consumer goods. Moreover, the appreciation of the exchange rate, combined with higher domestic inflation than foreign inflation, forced up the level of interest rates, thus attracting foreign capital, which also stimulated the growth of domestic aggregate demand. Increased flexibility in real exchange rate appears to be the only and sensible choice because any form of fixed value or peg may be quite vulnerable to a sudden loss of credibility, which is quite likely in the transition process to a market economy. Therefore, managed floating with inflation targeting seems the best alternative for small economies, like Cuba, given the need to manage the availability of scarce foreign liquidity and to keep a competitive real exchange rate. Accumulation of foreign liquidity is also a necessary complement. This policy prescription was advanced and developed by Goldstein (2002) and has been fruitfully adopted by an increasing number of Latin American countries in recent years. An export policy focused on providing information, supporting marketing abroad, and facilitating access to export finance and insurance can help diversify production. ProChile16 confirms that this is quite possible. In this regard, an active commercial diplomacy geared to securing market access, identifying new opportunities, and counteracting trade restrictions can help expand exports. Government agencies can also assist firms, especially small and medium sized businesses, to deal with issues such as technology diffusion and innovation, and with human resource development. In addition, other key policies geared to foster productivity are needed to reap the full benefits of international specialization and the dynamic gains from trade liberalization, in a world characterized by persistent and significant failures in markets for technology, credit and human capital, considering that technology is not a public good and the process of acquiring technological capabilities is not automatic. The combination of outward orientation based on a realistic exchange rate with technology and industrial policies may encourage greater exploitation of dynamic scale economies in the presence of market failures in technology, international trading information and financial markets, factors that according to Nobel Laureate Stiglitz (1996) helped to explain the superior growth performance of East Asia vis-à-vis Latin America. Fostering export growth for sustained economic growth also requires designing a comprehensive strategy on the basis of building and maintaining adequate physical infrastructure. Chile has been able to develop an impressive economic infrastructure (roads, airports, etc.) through public concessions to the private sector since the mid-1990s. The lack of fundamental economic and institutional reforms in Cuba and the overvalued exchange rate explain the unsatisfactory export performance in recent years and the dependence on permanent transfers from external sources in 1994-2002. Proper policies prevent pitifully poor performance but negligence and irresponsibility inevitability lead to loss of standard of living. The limited recovery was made possible by Cuban natural competitive advantages in a few goods and services, the enormous economic slack prevailing in the first years of the 1990s, and took place simultaneously with deepening dualism and shrinking of the capital formation. Increased external financing will not be useful and successful unless proper institutions, practices, and adequate policies are in place. Cuba still has to adjust to the new, more competitive international context. The lack of enough foreign exchange is a main stranglehold for production and investment in the economy. Cuba’s notable competitive strength based on its most potentially advantageous factor, its skilled labor force, is not currently used in an intensive manner and it is discouraged by the artificially high wage policy of the government by charging the foreign enterprises in dollars but paying the Cuban workers in pesos. The overall situation presents challenges that require bolder initiatives and much less dogmatism in several areas as some Cuban academics and researchers have correctly pointed out (Monreal, 2002a). Based on the strategic lessons learned from the experiences in transitions economies and in Latin America in the 1990s, Cuba needs three main systematic, broad and in-depth policy reforms tailored to its own capabilities, constraints and opportunities: (1) institutional reforms to use more the market mechanisms and practices,17 (2) trade liberalization, and (3) a competitive and flexible exchange rate. The proposed reforms will raise enormously Cuba’s growth potential and make it more resilient, faster and less vulnerable. Also, they will reduce the mismanagement and weakness of state-owned enterprises due to lack of foreign competition and proper information for sound business decisions; open significantly the economy to external trade, reducing the worst inefficiencies of an inward orientation in a small economy; diminish considerably the dependence on a few basic commodity exports and reduce the export vulnerability to terms of trade shocks; decrease the reliance and dependence on foreign savings and lay the foundations for a higher investment rate; and will reduce the fragility of the external debt profile. These three fundamental policy reforms, but particularly a competitive and flexible exchange rate, will also allow Cuba freedom in the choice of fiscal-monetary policy mix. However, they will require other complementary administrative and export promotion policies to transform faster external growth into better economic performance as the successful Chilean experience has clearly shown since the mid-1980s. The partial recoveries of the external sector and of the economy in 1994-2002 were based on three main pillars: (1) the continued intensive use of natural resources to expand Cuba’s export base of goods and services, (2) the access to remittances from Cubans living abroad, and (3) moderate access to foreign direct investment (FDI), mainly in tourism, tobacco and mining, and short-term foreign credits. However, these revenues could in no way compensate for the massive Soviet subsidies and aid to the Cuban economy. The new pattern of development and of international insertion is insufficient to achieve Cuba’s economic and social development goals over the long term and to insure a permanent improvement in the standard of living of the population. The Cuban economy remains anemic and below its 1985 level despite some recovery since 1994. With the decline of sugar, tourism and FDI already felt in 2001 and 2002 and most other economic indicators pointing downward, including an increase of inflation, the Cuban economy is on a new downturn. In 2003 the country’s balance of payments has been in its worst shape in several years and can only be expected to benefit partially from the improving international economic situation. The government’s erroneous policy responses have been a tightening of controls (including foreign exchange controls)18 and trying to increase social spending with the predictable results of increasing and widespread scarcities and distortions as evidenced by the increasing exchange rate premium, as well as expanding budget deficits that are being financed predominantly by monetary expansion and decreasing capital formation. Therefore, the main ingredients for a new economic crisis are present. The inadequate policies for the external sector are responsible for the unsatisfactory developments in 1990-2002 and have adverse implications for the sustainability of current economic recovery and financial inflows. Once again, an inward development strategy for a small country has been exposed as an economic loser. The failure of exports of goods and services to expand, as expected, under the current institutional and policy conditions and development strategy, risk the continuation of economic recovery. Given the small size of the Cuban economy it is unfeasible to function as a closed economy and without market mechanisms and institutions. Prospects in the short and medium term are bleak. The current strategy appears to be crumbling, like the buildings in old Havana so many times mentioned in Zoé Valdés’ novels. Nevertheless, Castro hangs on to his wishful vision, in spite of the hardnosed analysis made by the island’s academics and researchers on the island, hoping for some turn of fate and blaming the U.S. embargo for the downturn. It is hard for him even tacitly to admit a mistake. But the island’s academics and researchers cannot follow his irresponsible lead. Sooner or later they must address questions about this policy and strategy. Although there is no agreed road map, Cuba needs a new development strategy tailored to its own capabilities, constraints and opportunities to open its economy, to make reforms to be more competitive and efficient, and to develop more goods and services for export that will permit increasing and sustained growth. Cuba also needs to increase and diversify its export basket and improve its debt/GDP ratio to reduce its external vulnerability. As discussed above, trade liberalization is very important but it is not a panacea. In order to work it must supported by sound macroeconomic and exchange rate policies, fundamental institutional changes addressing the lack of market mechanisms and practices, and other pro-export domestic policies. 1. The author appreciates Armando Linde’s comments at the 2003 ASCE Annual Meeting and Jorge Pérez-López’s editing. The author is very concerned for our ASCE colleagues in jail: Marta Beatriz Roque Cabello, co-author of “The Fatherland Belongs to All” and President of the Cuban Institute of Independent Economists, her deputy Arnaldo Ramos Lauzarique, and Oscar Espinosa Chepe. 2. Cuba’s poor economic performance is partially the result of the mismanagement of billions of rubles of Soviet subsidies and aid. Massive transfer of resources does seem to be a curse rather than a blessing, as it imposes a heavy drag on long-run economic growth. But the real curse of this transfer was not so much that it incited the infamous “Dutch disease”’—the misallocation of resources away from tradable sectors. Rather, it was that it allowed a series of pathologies—rent seeking, patronage, corruption, and plunder—that corrode vital domestic public institutions and undermine governance. 3. CEPAL (2001) considers it a change in terms of trade. 4. Any bilateral trade deficit was financed almost automatically by the Soviet Union and re-exports of surplus Soviet oil shipments to Cuba served to finance trade with the West in hard currency. 5. This first economy encompasses all of the gross inefficiencies of socialism. Nearly everything ordinary Cubans must buy, including sugar, is rationed. Store shelves are empty and people either do without or improvise things to keep them going. That is why Cuba is frozen in time, a land of steam-powered locomotives and 1957 Fairlanes. The second economy serves some foreign markets and Western tourists providing luxury hotels and other modern installations at beaches, off-limits to ordinary Cubans. The third sector is the absolutely essential underground economy, despite the fact that it is illegal. Socialism holds that buying and selling in a market setting is evil and exploitative, and refers to it as speculation. Yet, this is the only market open to ordinary Cubans that do not have access to dollars and actually works. If it were not for the underground market, many Cubans could not purchase necessities like cooking oil and other basic foods, not to mention luxury goods such as footwear and clothing. 6. The government implemented a sharp decrease in the fiscal deficit through deep cuts in government spending including social expenditures, capital formation expenditures and subsidies to enterprises, as well as an absolute reduction in the money supply. 7. Statement by Cuba’s foreign investment minister, Marta Lomas, as quoted by European sources in “Foreign investment in Cuba falls, EU wants reform,” Reuters, Havana, July 8, 2002. 8. Moody´s Latin American Rating Lists as of April 1, 2003, at www.moodys.com.br/pdf/LARL%20April.pdf. 9. Statements by an anonymous Japanese creditor and by Francisco Soberón, head of the Central Bank of Cuba, as quoted by Marc Frank, “Cuba said to miss Japan, Mexico debt payments,” Reuters, Havana, October 25, 2002. 11. “Although sanctions clearly create suffering in many places, how often have they achieved the desired goal? In Myanmar, Iraq, North Korea, and Cuba, despotic regimes not only survived the imposition of sanctions, but became more despotic. These regimes were able to blame foreigners for domestic hardships, even when it was their own policy mistakes and human rights abuses that caused the crises. Indeed, sanctions weaken an economy and public health, but do not necessarily make it more likely that a despotic regime will collapse. Sanctions purportedly undermine the regime by causing widespread unrest and by reducing the government’s power base and tax collections. But sanctions also weaken the ability of the private sector to finance an opposition, tend to cut off the domestic opposition from international sources of support, and reduce, rather than increase, international awareness of the abuses taking place” Sachs (2003). 12. Elaine de Valle, “Crece el tráfico de medicamentos desde Cuba,” El Nuevo Herald, September 30, 2003. 13. Changes in the exchange rate of a major trading partner relative to the dollar might bring unexpected and undesirable change in the effective domestic real exchange rate. 14. In a study of Latin American countries, Khan and Zahler (1985) found that the balance of trade effects had serious consequences for the growth of output. 15. Chile’s post-1983 strategy has relied on an outward orientation based on a large real depreciation supported by appropriate fiscal and monetary policies, a bit of support for non-traditional exports in agro-industry, saving mobilization through pension privatization, and discouragement of short-term capital inflows. 16. ProChile is the Chilean Trade Commission, an agency within the Chilean Ministry of Foreign Affairs. Its role is to support and advance Chilean business interests in the global marketplace by assisting in the development of the export process. ProChile is active in establishing international business relationships, fostering the exchange of goods and services, attracting foreign investment and forging strategic alliances. It serves as a source of market research, international trade data and leads for the export industry for both foreign and Chilean firms alike. Though ProChile seeks to stimulate and diversify the country’s export base in general, special emphasis is given to promoting non-traditional products. 17. The establishment of the most basic of these mechanisms and practices, and a fair level playing field can be expected to unleash a flurry of new investments and entrepreneurship, to spur productive dynamism, as well as to lower regulatory burdens and corruption, as they did in the early 1980s and in 1994-1995. Both experiments with market mechanisms, incentives and practices were quite successful in Cuba and brought immediate results (Hernández-Catá, 2003). Aslund and Johnson (2003) consider that small and medium enterprises have played a key role in the successful transitions in Poland and Hungary and explain 50 to 60 percent of their GDP today. 18. Managers and foreign enterprises doing business in Cuba are in an uproar over the government’s move in July to introduce foreign exchange controls for state-owned enterprises. They were ordered to hand over their dollars and were ordered from now on to buy dollars from the Central Bank for their imports and debt payments and local purchases from joint ventures in Cuba. Foreign suppliers and businesses in Cuba that sell products to the state-owned enterprises complained that they will face further delays of over two weeks in collecting payments and arrears from the cash-strapped state. Local analysts and businessmen say the measures were taken by the government in response to the hard currency crunch it faces due to a stagnant economy and scarce foreign investment.